Yale scientist and Authorea Fellow Fabio Del Sordo just got back from a once-in-a-lifetime trip: he traveled to a group of remote arctic islands to chase one of the most inaccessible solar eclipses of the century. We asked him some questions. Fabio, when did you decide to go watch an eclipse in the Arctic? I’ve been feeling this urge to visit the northernmost parts of Earth for a while now. My PhD in Stockholm gave me the opportunity to explore the Norwegian coastline and Lapland, but the Arctic was a different story. A sort of forbidden dream. Then last year I started a postdoc at Yale, in the research group led by John Wettlaufer, who’s an expert on sea ice and the Arctic. When I heard there was gonna be a total solar eclipse at Svalbard I knew I had to go. Svalbard is an archipelago situated about half way between continental Norway and the North Pole, and it is an outpost for research and arctic exploration. In Longyearbyen, a little city of about 2000 people, and Svalbard’s capital, there is the world’s northernmost institution for higher education and research: the University Center in Svalbard. How hard it was to plan your trip? I knew 2015 was gonna be a busy year for me, due to a combination of science projects, outreach with the GalileoMobile Constellation and other trips. But this was the chance of a lifetime and I couldn’t let it go. 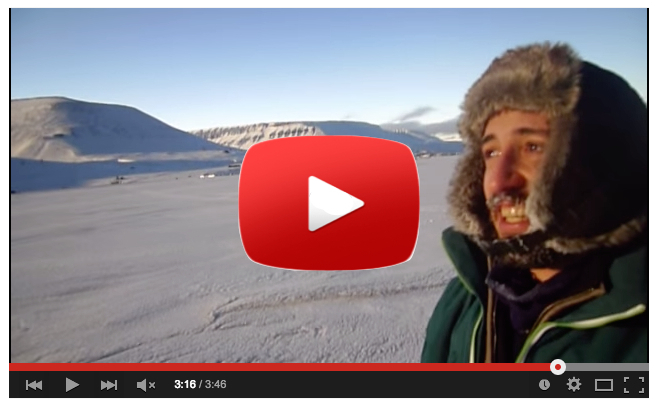 Within a few days after the idea sparked in my head, I had booked flights from New York City to Svalbard. Then I started planning the journey to meet the Sun and the Moon in the same spot of the sky. It was not easy, Svalbard is not exactly human-friendly. A rifle is mandatory if you adventure outside by yourself. You know, in case the polar bears are in a bad mood. After traveling a long distance and waiting for hours in a sunny - but very cold - morning, I saw the eclipse from the snow-covered valley of Adventalen. This place became an almost extraterrestrial land during the two and a half minutes of darkness, a show that left me in absolute awe. I think this video is the best way I have to show you what I saw and what I felt that morning.